Of all Mozart’s piano sonatas, No. 11, “Turkish March,” is the most unique. It’s also his best. And Mathias Énard seems to know why. Or rather Franz Ritter does, the narrator of Énard’s Compass, a novel exploring alterity, that fancy buzzword meaning the state of being Other, or different. It’s a pretty hot topic in philosophy departments and divinity schools. Ritter is a Viennese musicologist and orientalist, obsessed with the East’s influence on Western music and art and literature, and a French woman named Sarah. A colleague and elusive old lover, she’s mailed him an article, and now he can’t sleep. A product of Ritter’s insomniac thoughts, the book takes place over the course of a single night. Énard’s 2008 novel Zone, about a French intelligence agent trying to sell the Vatican a briefcase of secrets, took place over the course of a single sentence, a long-winded work of post-modernism, for which it is difficult to muster the required breath. And that’s only half of the sentence. This isn’t simply a fitful style for an insomniac, it fits the book’s theme, of the middle, the meeting place, how “the Danube is the river that links Catholicism, Orthodoxy, and Islam,” as Sarah once said, or Imperial Vienna as the capital of the Hapsburg Empire, the Empire of the Middle, Vienna as a gateway to the East, Vienna as the Porta Orientalis, the subject Ritter wants to write a book about because he can hardly think of anything else. He even owns a compass that points east. There’s a lot in that opening sentence. The face in the mirror, the other. “The rift of alterity.” Opium, that gateway drug to the East. The fluidity of identity. These are the subjects that occupy Ritter’s mind, keeping him from sleep. His travels with Sarah to Istanbul, Damascus, and Tehran, orientalists falling in love. How “sometimes a kiss changes an entire life, fate changes course, bends, makes a detour.” How she gashed him and married another. Nationalism, the cause that ripped Europe apart in the early 20th century, and what is again ripping it apart in the early 21st. 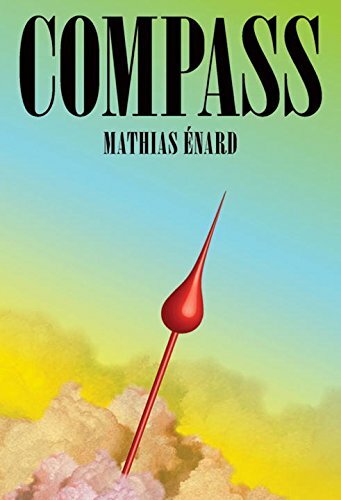 The Ottoman Empire was once called “the sick man of Europe,” but today, Énard writes, “Europe is its own sick man, aged, an abandoned body, hanged on its gallows, which watches itself thinking Paris will always be Paris, in about thirty different languages, including Portuguese.” Compass was first published in France in 2015. Today, in 2017, refugee tent cities have popped up in the heart of Paris. No longer must a European journey East to see the other; the other has come to the European. “Islamists fighting against Islam. The United States, Europe, at war with the other in the self.” The other in the self. Back to the face in the mirror. “There is always the other in the self,” Sarah writes in a letter. This is why both she and Ritter seem to think Edward Said had it all wrong, or at least hold him at arm’s length. Though associated with colonial injustice, orientalism wasn’t really about exploiting alterity, an objectification of the Other. It was about discovering the other within oneself. But all that isn’t important. Underneath his insomnia isn’t “the rift of alterity” but the anguish of unrequited love. Sarah married another. And she was never any man’s. She belonged to “her search for the meaning of Orient, endless, infinite.” Her journey was always spiritual, not academic. Eventually she spends time in Darjeeling, meditating and learning at a Buddhist monastery. Her letters speak not of “converting” to Buddhism but taking refugee in the Buddha, the Dharma, and the Sangha, of following “the direction shown by these three compasses.” Seeking escape not from life but from dukhha, the suffering that comes from the awareness of life’s impermanence. She’s moved “East of the East,” to move beyond love. But Ritter can’t move on. His insomniac rambling tries to put everything together, but Compass isn’t a dissertation on alterity. It’s a love story. Because what can bring us closer to the Other than love? What brings us closer to ourselves?